Blog Quick Quotes: Off The Page with Donna! Off The Page with Donna! Hi everyone, Donna here today I am excited to share with you a new line from Quick Quotes called Baggage Claim. With thoughts of vacation on my mind, I made a mini album, which I will share with you next time, but I wanted to show you this cute little suitcase that will hold the mini album. Isn't this line fabulous! I just love this line but what else is exciting is the new 12 pack of Powderpuff Inks with all new colors, and they match this new line perfectly! The handle is from an old purse which I cut down to fit this project and used super glue to hold it securely. I found some other embellishments in my stash that I added to the front. The film strip, ticket and stamp are all from the Baggage Claim chipboard and sticker packs. My mini album will have lots of pockets so I added some extra places inside the suitcase, like the pocket on the cover to put in tickets, maps, passport, whatever. And there is also a panel underneath. Just pull the ribbon tab up. Under the secret panel, is another place to store papers or a mini log. Inside is a travelogue to put underneath. Place to keep notes or add some more pictures. Here is a sneak peek of the mini album I will share with you next time! Thanks for stopping by Quick Quotes today and be sure to check out the new line here! I want to make this. 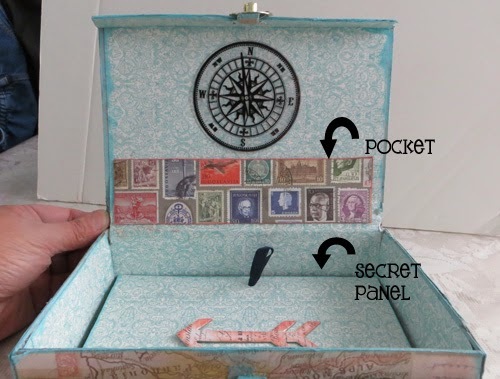 I travel a lot and this would be a perfect way to keep memorabilia and pics. I could make one for each trip decorated for the country I visit. I love it! Where is the propeller from? The propellor is from Michaels, was in the jewelry dept. clearance last year, isn't it perfect? They might still have it where you live. Good luck. I love it! I actually have the locket with the propeller in my stash - I bought it on sale last year, too! Love that you recycled the handle from an old purse!